Today is my first time to fly since the tsa started the pat downs and since they got body scanners. I even skipped wearing a belt this morning to make thing easier. First I got screamed at five times by an id checker. That's right five times! Then he didn't even look at my I'd. Next, I had to go through the scanner. I thought this would be no issue but apparently I left a pony tail holder in my pocket. They saw it and asked me what was in my pockets. I realized and took it out and showed it to them. I then proceeded to pull my pocket inside out to show them it was empty but it didn't matter. They said they had to pat me down. She asked if I wanted to go to a private room. I said no because I didn't realize what an extensive pat down I was about to receive. I think they went way over board. I went from feeling what's the big deal about being patted down to totally against them. There was absolutely no reason to pat me down or the other poor people I also saw getting patted down. What's next having to take your clothes off. 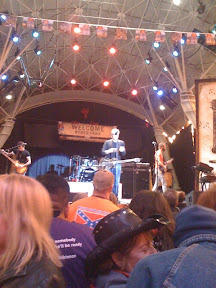 Jack Ingram was performing in Las Vegas at the annual Fremont Street Hoe down. This is an annual thing with tons of performances and it is all completely free. It is always right before the National Rodeo begins. It was a great concert. We even got to meet him afterwards. 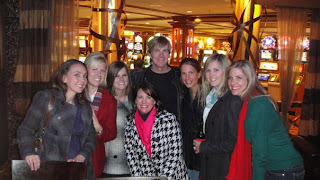 Did I mention that I actually got to meet Jack Ingram? If you go to thecheesecakefactory.com/share, for every $5 you donate for hunger, you get an e-slice redeemable for a free slice of cheesecake. When you consider most of their slices start at $6 you are actually saving $1- $3 depending in what you order. For the month of December if you get a friend to get a players card you each get $25 in free slot play. The Grazie card is good for the Venitian as well. 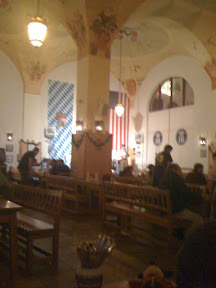 There is a great German restaurant called the Hofbrauhaus in Vegas that is kid friendly. 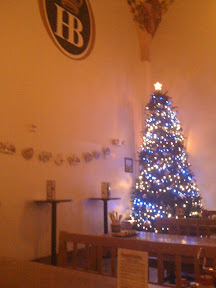 The food is good, the portions are large, they have a live band and the waitresses are giving spankings to the customers. 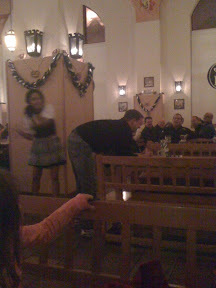 Here's a guy getting a spanking from the waitress. I'm not sure why they were doing this. I asked our waitress what the deal was and she said because the asked for one. They would lightly tap them twice and then hit them really hard. Atleast 15 people did this while we were there. My kids thought this was hilarious. 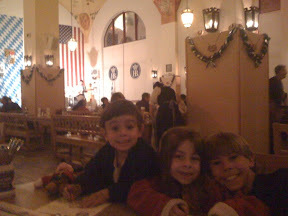 Other than really awful service it's a fun place to go with kids. Just know you are going to wait a long time for food and that it will be expensive. 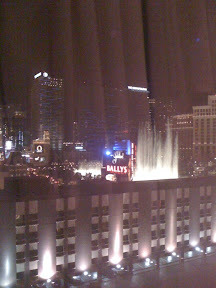 Here is a picture I took from my parents hotel room at the Flamingo in Las Vegas. Their room was pretty basic. Not bad, but not great for a hotel that was supposedly remodeled. The best part of their too was the view and location.